View of the ruins of St Mary's Abbey at York. A monastic community was established in York c.1086. Under Royal patronage, it was to become one of the wealthiest and most powerful Benedictine monasteries in England. The abbey was built on a spot just outside the city walls which had been donated by Alan, Earl of Richmond. 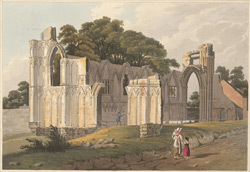 The ruins seen here were the result of a rebuilding of the abbey in the 1270s by master mason Simon of Pabenham. The late 13th century church's ruins suggest how impressive a structure it would have been.